When I was a young girl, Tibet was a free nation. I belong to a region called Kham. It is in the North-east of Tibet. I was not from a rich family but we led a self-sustained, nomadic and happy existence. In the summer, we used take the cattle to the highlands to graze and would play in the flowers that bloomed there. In the winter, we would celebrate festivals. In free Tibet, we could practice our religion and celebrate our festivals freely. The main centre where everybody gathered was the monastery. There were so many Buddhist monasteries. During Losar (the Tibetan New Year festival), everyone used to go to the monasteries and sing, dance and do theatre. We all wore traditional clothes and jewellery. If you wanted to go for a pilgrimage to Lhasa, there were no restrictions. My family was a very religious Buddhist family. I feel very fortunate about that. In 1949, the Chinese invasion began. I was part of the first protests when the Chinese came. Thousands of Tibetans were out in the streets to stop the forces from reaching Lhasa. During the invasion, I saw Tibetan people die like animals in Amdo (near the Kham border). The Chinese bombarded us with air raids. There were corpses and blood all around in Amdo. They had all come out on the streets to protest the invasion, to keep the Chinese troops from reaching Lhasa where His Holiness was. They were trying to protect him. My husband died in 1958 when I was 26. He was a kind of troublemaker for the Chinese. Since the Chinese invasion people had been trying to get to Lhasa to protect His Holiness, the Dalai Lama. Small underground meetings were held in people’s homes. My husband was so brave that the Chinese could not kill him with a gun, so they poisoned him. He died suddenly and his teeth and nails were black – signs of poisoning. I was four months pregnant with my daughter at the time. We already had a son. Soon after my husband died, my sister’s husband was arrested, publicly humiliated and shot in the head twice in the public square to set an example. A few months later, I was arrested along with 300 women while participating in protests against the Chinese. My daughter was a newborn. My four-year-old son cried and caught hold of a Chinese soldier’s leg when I was arrested. They kicked him aside and dragged me away. The late 50s, when I was arrested, was the worst time. The Chinese began openly lashing out at high ranking monks and suppressing religious activity. I was a political prisoner for 27 years. Only four of the 300 women survived. The rest all died in prison. I was taken to eight different prisons in Tibet and China during my period of imprisonment. The most difficult time was the first three years in Inganse prison. We weren’t given any food, just crushed corn in lots of water. A lot of people died from starvation. We ate the souls of our shoes. We were so hungry. The four of us survived because we were in charge of feeding the Chinese pigs. We ate some of the vegetables and grain that was for them. I pray that no one ever has to go through what my fellow prisoners and I have suffered. The 27 years of prison were worse than hell. When I came out, I was half mad, suffering form acute depression. I would cry a lot, then suddenly laugh a lot. The slightest sound scared me. My body was like a skeleton. My eye sockets were sunken. I went to a traditional Tibetan doctor to be treated for depression. It is such a painful procedure but I was laughing the whole time because of the depression. I couldn’t feel my own pain. The doctor cried when he saw me like that. When I came out of prison, I was in a bad medical condition. I had to see a Chinese doctor also. My feet were severely damaged from walking barefoot in prison and from the cold. I also had problems with my ears because a Chinese soldier had kicked my ear when I was first arrested. But the Chinese doctor told me I could only be treated after making a payment of 300 Chinese yen. Three hundred yen? An ordinary person cannot afford 300. So, friends and relatives got together and collected the money and then the Chinese doctor treated me. When I came out of prison, everything had totally changed in Tibet. I could hardly see any monasteries around. The golden colour on top of the monasteries was now all black. I especially remember one big monastery – Kharnang monastery – had been destroyed. 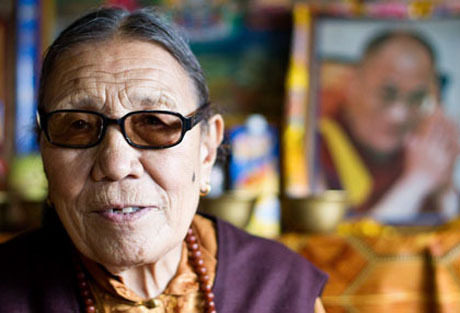 The head monk – Kharnang Rimpoche – had been in the same prison as me. He was killed. Nobody knows how but it is suspected he starved. The trees near where I lived had been cut down. Their trunks had been so big that you would need two people’s arms to circle around them. These trees were now being sent in trucks and through waterways to be sold in China. There were a lot more Chinese people settled in Tibet. Many Tibetans had moved out to remote areas. My son had died when I was in prison. I don’t know how but I heard he drowned. When I came out, I met my daughter and could not recognise her. People had to introduce us. Eventually a bond developed and she started calling me mother, but initially I felt closer to my fellow prisoners. Two years later, in 1987, I fled to Nepal and in 1988, I reached Dharamsala, India. I have been living in the same room for 22 years here in exile. I am happy here. Buddhism is the most important thing to me and I am happy to be in the land where it started. I am free here. I can do anything and nobody stops me. Since I have been in exile, I have toured many countries around the world. In 1989 I went to Germany to take part in international hearings on Tibet and human rights in the parliament in Bonn. I was given only five minutes to speak. The Chinese officials present argued that I had suffered under Mao’s regime, not under Deng Xiaoping’s regime and so they could not be held responsible. But people in every country have been very supportive. Even Chinese people around the world have been very receptive to my story. When the students were killed in Tiananmen Square, I gave a talk at Harvard University. Afterwards a Chinese student asked me how I see Chinese students. I said I have nothing against Chinese students or the Chinese people. When I was in prison, all the Chinese and Tibetan inmates used to say we have the same opponent – the regime. I said it is the Chinese Red Guards we are against. The students came and gave me a hug. When I was prison, I made a promise to myself that I will stay alive to tell my story, to share it with His Holiness and for the Tibetan people, particularly those who have died and suffered the most. When I met His Holiness, he told me that you don’t need to lie or be angry towards the Chinese. You only need to speak the truth and this truth alone will support us. Before I die, I wish to see His Holiness sitting inside the Potala Palace in a free Tibet, where he and all of us belong.